This photograph was taken at Quorn Rawlins School sports day around 1907. It was in a very poor and faded condition, but has been restored, which has revealed more detail. Some of the girls are holding hockey sticks, but perhaps the most obvious sport is that of rifle shooting – not a sport you would find on the curriculum today! 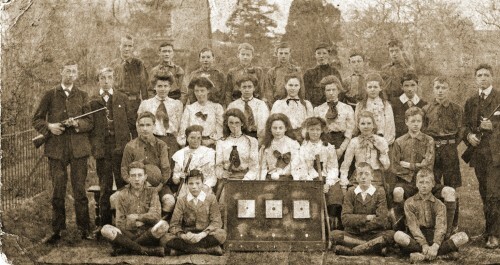 The boy sitting on the extreme left of the second row (holding a football) is Wilfrid Ernest Mee, then aged about 15. He lived on Leicester Road with his family and in later life became the organist at Quorn Baptist Church. Wilfrid died in 1964. Can you provide any more names? Missing information: Can you provide any more names?